The Plan Toys 'My First' Dollhouse has a balcony and its design provides easy access from all sides. There are four rooms which can be furnished inside as a bedroom, bathroom, living room, kitchen or dining room with different accessories (furniture not included). This toy dollhouse for kids is built with organic rubberwood trees that are too old to produce latex. This saves trees from being cut, burned and discarded. Children can role play different characters such as father, mother or children, helping to develop their creativity and imagination. Parents can help explain the functions and the signs of living in a house. Children can interact and play together with other children providing hours of fun and developing their social skills as well. Clean, natural rubberwood recycled from rubber trees no longer able to produce latex. 3 years before the wood is used, no fertilizer is added so that the wood stays chemical free. Moreover, to stabilize the wood a time consuming chemical free kiln drying process is used. 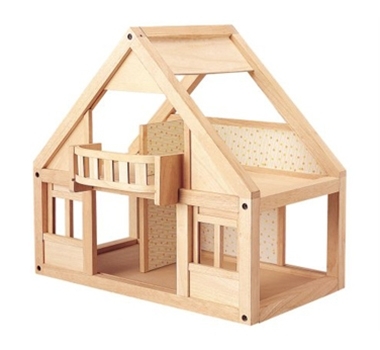 This Plan Toys 'My First' Dollhouse is assembled using a proprietary, non-formaldehyde glue in place of the traditional toxic wood glue and E-Zero which means it contains no Formaldehyde emission. Non-toxic, water based dyes are used to add accent colors to their products. This color contains no heavy metals. Recycled and recyclable materials are used on this dollhouse for kids to minimize impact on the environment. Soy ink & water based ink are used on printed materials. This ink decomposes more quickly than regular chemical ink and can be recycled more efficiently. 24.6" x 16.5" x 22.6"